Of-late there are rumors are spread about Sri Raju during the past 4 – 5 years. It is being rumored that his health is not good, he is suffering with ailments and few instances of his death as well. It is felt that these rumors stemmed out of two major factors – firstly, Raju garu not making public discourses, and secondly due to end of telecasting of “Mee Aarogyam – Mee Chetullo” program. As Sri Raju is personally supervising the Ashram activities from 2012, these two programs are temporarily suspended. Another reason is that there are few who realized the real potential of naturopathy tried to rope in those who are disinterested in naturopathy. These disinterested people started propagating that – even Sri Raju has practiced all he has preached, he still suffering with ailments. Those people started to find out about the truth from different people who are unaware of the facts. Sri Raju garu feel that some of the above aspects are causes for the bad propaganda happened. 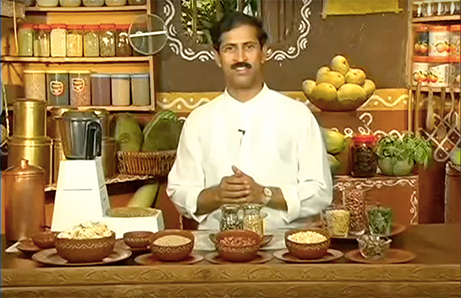 Recently – Maa Gold has started telecasting “365 Arogya Rahasyalu” program from 6.00 – 6.30 am where in Sri Raju is participating and which reiterates the health and good condition of Sri Raju garu.